Air Rifle Shooting in the Forest of Dean. The air rifle is a great introduction to rifle shooting, where precision, patience and skill are required. 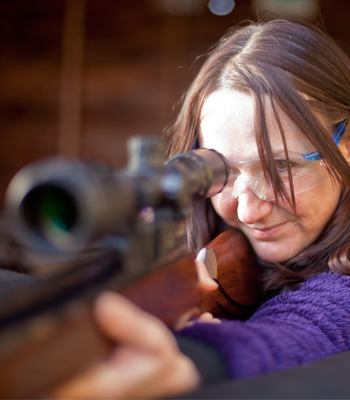 Should you wish to become a hunter, or learn the skills, then our air rifle range is the place to start. You will be equipped with a modern pre-charge air rifle with telescopic sight. Down the range we have a selelection of spinning and knock down steel targets, classic scoring paper targets and the option of a moving deer target. With coaching throughout the session, you will soon discover how compelling this sport is and how competitive it can be! Always wanted to just have a go at air rifle shooting? But didn't know where to go to try it out? DBC Leisure here in the heart of the beautiful Forest of Dean is the place. 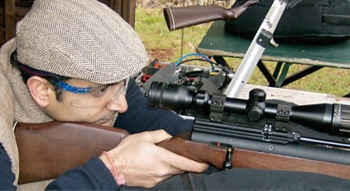 By yourself or with your family and friends we can give you an introduction to air rifle shooting with some excellent quality gear and instruction to get you started in this great sport. Even if you have been before and would like to improve your skills or try something a little different we are happy to help. How about having a go with our moving deer target? Or trying out our pistols? If you are a visitor to country fairs or local events you may have seen our mobile air rifle range. If you are staging an event and are looking for a 'Have a go' type attraction then we may be interested in attending. Suitable for beginners and experienced individuals or groups. and consumables. Group rates on request.